This weekend, a tsunami of holiday films will crash down upon us, threatening to submerge us in cinematic overindulgence. With dozens of movies vying for your attention and Christmas fast approaching, it’s unlikely you’ll find yourself with much free time. However, if you should happen to be in the mood for an alternative to the obvious yuletide fare — like “The Hobbit: The Battle of the Five Armies” or “Into the Woods — there is one choice that rises above the rest, along with one over-hyped epic that deserves to be passed over. There are few cinematic experiences that truly astonish, but “Birdman” is one of those rare discoveries. Director Alejandro Gonzalez Inarritu’s darkly funny, painful, unexpectedly deep rumination on showbiz, ego and the human condition is a movie that has to be seen to be believed. Nominated for seven Golden Globe awards, the film has a serious shot at carting off the best picture Oscar in February. “Birdman” is exciting on several levels, beginning with the way Inarritu and cinematographer Emmanuel Lubezki create the illusion the film was shot in one long, exhilarating take, winding its way through backstage corridors, out into New York’s Time Square and back again. The movie is fun to watch even as Inarritu heaps his signature humiliations upon his characters, chiefly Michael Keaton’s has-been actor, who briefly tasted fame in a before-its-time superhero flick and seeks redemption by writing and starring in a Raymond Carver adaptation on Broadway. The role feels more than a little autobiographical for former Batman Keaton, who basically lays all his wrinkles and a receding hairline at our feet in a vanity-free performance that is a breathtaking revelation. The entire cast of “Birdman” is amazing, including an adorably messy, big-eyed Emma Stone and Edward Norton, so vital and commanding here, you’d think he somehow resurrected his younger self from his “Fight Club” or “American History X” days. Playfully meta with a feverish intensity that recalls “Black Swan” and “All That Jazz,” “Birdman” has smart, clever, pop culturally literate things to say about our celebrity obsessed society. It’s the anti-“Avengers,” but like a good comic book movie, it’s a total rush. The filmmaker takes more than a few liberties with the Biblical account of Moses, but sadly none of them are very compelling. In this version of the scriptural saga, the revered leader of the Israelites is played by Christian Bale as a wise and brave general in Pharaoh’s army, raised alongside heir-to-the-throne Ramses (Joel Edgerton, bald and resplendent in eye liner). Sibling rivalry and daddy issues breed resentment between the siblings, just as they did between Russell Crowe’s general and Joaquin Phoenix’s prince in “Gladiator.” When Pharaoh (portrayed in an odd bit of casting by John Turturro) kicks the bucket, Ramses becomes Egypt’s ruler, even though Moses is the better man. Ramses discovers Moses’ true roots as a Hebrew slave and is terribly, terribly vexed, while his adopted bro reluctantly begins his journey as revolutionary savior of his people. 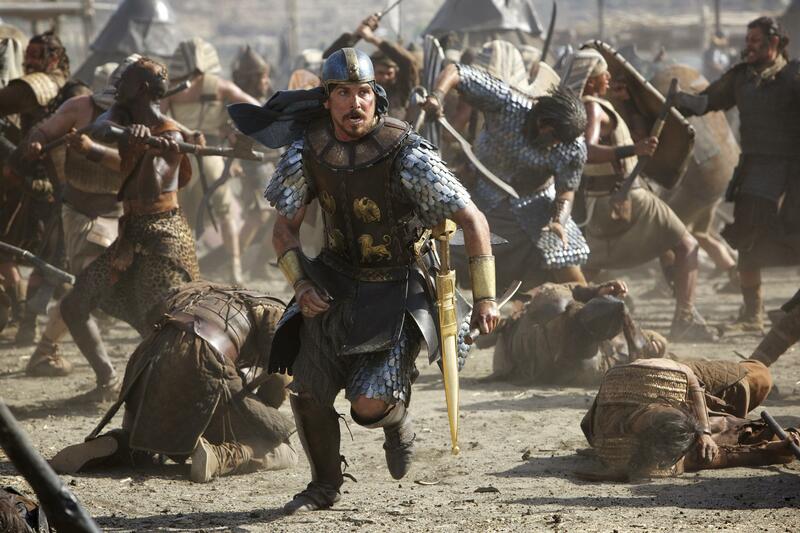 With its opulent Egyptian sets and costumes and impressive rendering of the plagues and other divine judgments in CGI, “Exodus” aims for the pomp and melodrama of great Biblical epics like “The Ten Commandments,” “Ben-Hur” and “King of Kings.” But with a running time of two-and-a-half hours, it plods along so slowly, it begins to feel as if the audience has been wandering the desert for 40 years. When it comes to Moses’ identity, Scott and the “Exodus” screenwriters can’t commit. Bale talks to God — the form the deity takes is bound to miff some viewers of faith — but only after suffering a blow to the head, so it’s possible his hero enjoys a direct line to heaven. Then again, he might just be insane. In the end what “Exodus” lacks is a well defined vision and the courage to examine religious conviction in all its complexity. This entry was posted in Uncategorized and tagged Batman, Birdman, Christian Bale, Edward Norton, Emma Stone, Exodus Gods and Kings, Fight Club, Gladiator, Golden Globes, Joel Edgerton, Michael Keaton, Moses, Oscar, Ridley Scott on December 19, 2014 by Lavender Vroman.